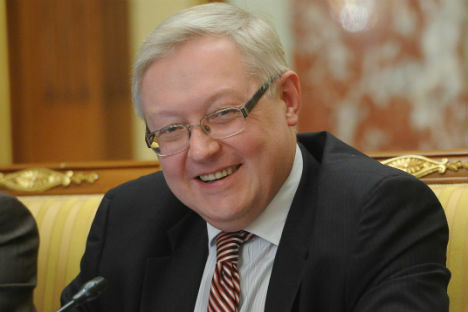 Russia’s Deputy Foreign Minister Sergey Ryabkov talks about the emergence of BRICS as a platform for global dialogue and practical cooperation. Has BRICS become an instrument of global governance? No, BRICS is not a mechanism of global governance. It is not for me to judge whether it is or will ever be such a mechanism, but at this stage BRICS is a catalyst for global governance reform. Although three billion out of seven billion people in the world are citizens of BRICS countries and although BRICS accounts for 25% of the global GDP, I cannot describe that structure as a mechanism for global governance. BRICS is still to a large extent an association based on interests. This is what makes it strong and viable. Right now, in BRICS 80% of issues pertain to the economic agenda and only 20% to foreign policy. The main global forum for coordinating approaches to economics is the G20, while BRICS works within that group. Incidentally, unlike in BRICS, the ratio in the G8 today is the reverse: 80% of the issues on its agenda relate to politics and 20% to economics. I don’t think we will ever come to see BRICS in “utilitarian” terms. Has BRICS developed a common philosophy? Definitely. Its philosophy is to not rush the process of transforming BRICS into an international organisation. That means that this option is not ruled out in principle? Russia would welcome the gradual strengthening of the institutional principles in the structure’s activities. We have concrete proposals. Russian President Dmitry Medvedev outlined them in Delhi. But we are not imposing anything on anyone. Because our partners so far prefer to remain at an informal and bureaucracy-free level, we do not think that BRICS has reached the limit of its institutional development. There is no limit, and development continues. What centrifugal and centripetal forces are at work within BRICS? It would be more correct to speak about varying-speed of development and the changing geometry. BRICS countries have different views regarding the priorities and the pace of progress on some issues. One such major political issue is the reform of the UN Security Council. Perhaps there are also topics like human rights, their role in the system of international relations and approaches to addressing problems in that area. But it is always the case that the glass is half full or half empty. Within BRICS, Russia always takes the side of those who favour concrete decisions and want to see the language of declarations translated into practical deeds. The year 2011 was unique for BRICS. All its participants were working in the UN Security Council: Russia and China as permanent members and the others on a rotational basis. Is cooperation in the sphere of international security still on the BRICS agenda? It is not only still on the agenda, but it is growing stronger. BRICS representatives in New York, Geneva and Vienna have established an ongoing dialogue and have been holding working meetings. They exchange messages and phone calls. It all takes place as part of the normal diplomatic and political routine. This is one of the major recent achievements. That is how interaction should be built if BRICS is not to remain an event involving heads of state meeting once or twice a year , as happened in 2011 when an informal BRICS summit took place in Cannes on the fringes of the G20, while the main event took place in Sanya, China. Interaction must proceed at all levels. If we have good coordination on pressing international issues concerning regional security, that already marks a step forward.